What is still keeping the band sound authentic, and maintains the authority is the guitar duo formed by the Stutzer brothers. Unfortunately, Michael Bastholm-Dahl’s voice is not keeping pace with the vitality of the guitar work, and doesn’t run with the characteristic thrash crunch of the band. His voice isn’t balancing the heavier riffs and doesn’t emulate the melodic chunks either. Worse, Dahl’s voice offers a power metal influence to the sound of the band. Though the album lacks any spectacular parts, there is a quite interesting shift in the tempo and feeling of the songs, which brings some diversity. The album kicks with a very classic Artillery sound through the opener ‘In Defiance Of Conformity’ but goes on a more melodic path with ‘Live By The Scythe’ and ‘Deity Machine’, songs that amplifies the power metal feeling induced by Dahl’s voice, and sustain by the cheesy repeating lyrics. The balance is inclined again in thrash favour by more exciting songs like ‘Penalty Of Perception’, ‘Mercy Of Ignorance’ and ‘Path Of An Atheist’. ‘The Magic Is Gone’ is one of the most colourless ballads, which seem more like a band experiment gone wrong. 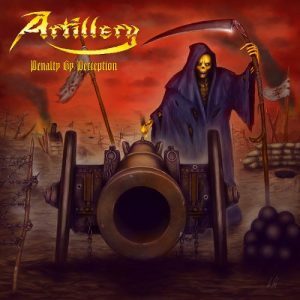 Overall, a well-executed album with solid guitar riffs and solos, but nothing great enough to be worth listening to over time, or to stand out in Artillery’s arsenal.